The best time to buy international airfare is not a “one size fits all” approach. Instead, international flights are affected by many different variables, with data showing some destinations benefit more from long-term planning while others don’t need as much booking lead time. 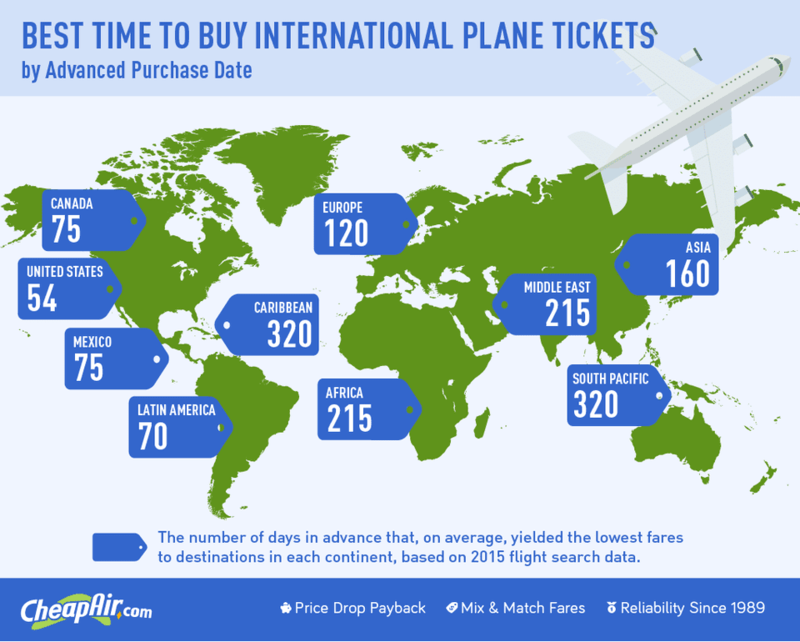 In general, the best time to buy an international plane ticket is between 120 to 160 days before departure. While this isn't true for every destination, this is generally the case for Asia and Europe. Beware of seasonality when booking international flights. Unlike domestic flights, international flights often have a massive disparity between the price during the low tourist season and the high tourist season, with high season flights possibly going for double the price. Also, those who decide to travel with friends and family may want to book especially early if everyone wants to sit together. You might pay a bit more, but you’re more likely to have this luxury if you get the booking in early. For those flying solo and have some itinerary flexibility, they might be more willing to gamble on nabbing a last-minute sale. Central and South America show the best time to buy is 70 days out from travel dates, which is closest to the national 54-day average. Occasionally, ticket prices will drop due to events in the country—the 2015 widespread outbreak of Zika virus put a bit of a damper on plans for American travelers, who do tend to be more conservative and focused on safety when traveling abroad. Canada and Mexico are also similar to the U.S. market, with 75 days out being the best time to buy airfare, on average. Mexican citizens typically travel during the country's national holidays, such a New Year's Day (January 1) and the country's independence day (September 16), which can drive up the price of airfare. To snag the best deals, go when school is in session, and government offices and businesses are open, avoiding days around the Christmas holidays and Easter. The best fares to Europe can be found at 120 days out, and European destinations are in high demand during the summer, when U.S. travelers typically make their international plans. It is not uncommon to be able to land a fantastic last-minute deal to Europe if you are traveling during the winter when fewer people go. Also, if you can fly into any European city and have some flexibility with your dates, you might snag a good deal at the last minute, especially out of larger gateway cities like New York that have many daily flights going to the region. Tickets to Asian destinations are cheapest approximately four months before departure. Larger cities like Los Angeles and New York City have the highest volume of flights to Asia, so if you can get yourself to one of these major hubs, you'll find tickets to be more affordable. Securing the best fares for the Caribbean requires a bit of planning: You'll find the best deals nearly one year out, at 320 days before travel. For most destinations, the high season is the U.S. summer and the low season the U.S. winter, although for certain sun destinations like the Caribbean and parts of Mexico U.S. winter is the peak. The best deals on flights to the Middle East and Africa can typically be found about 215 days before departure. Some countries or regions subject to political unrest can be very affordable to visit, depending on your level of adventure. As an example, Turkey’s terrorism and political problems in the 2000s made that nation a bargain for travelers, after years in which it wasn’t.